I can’t believe it’s been 2 years already since I had one of my best Septembers at Picturecamp, a week-long picture book masterclass hosted by Spanish illustrator Jorge Martin, in Atapuerca, Spain. I learned a lot from Jorge, Benji Davies, Alexis Deacon and Chris Haughton, and met many wonderful fellow writers/illustrators, and developed priceless friendships (some of us reunited at this year’s Bologna Children’s Book Fair). This masterclass filled me with inspiration, determination and, most of all, hope. 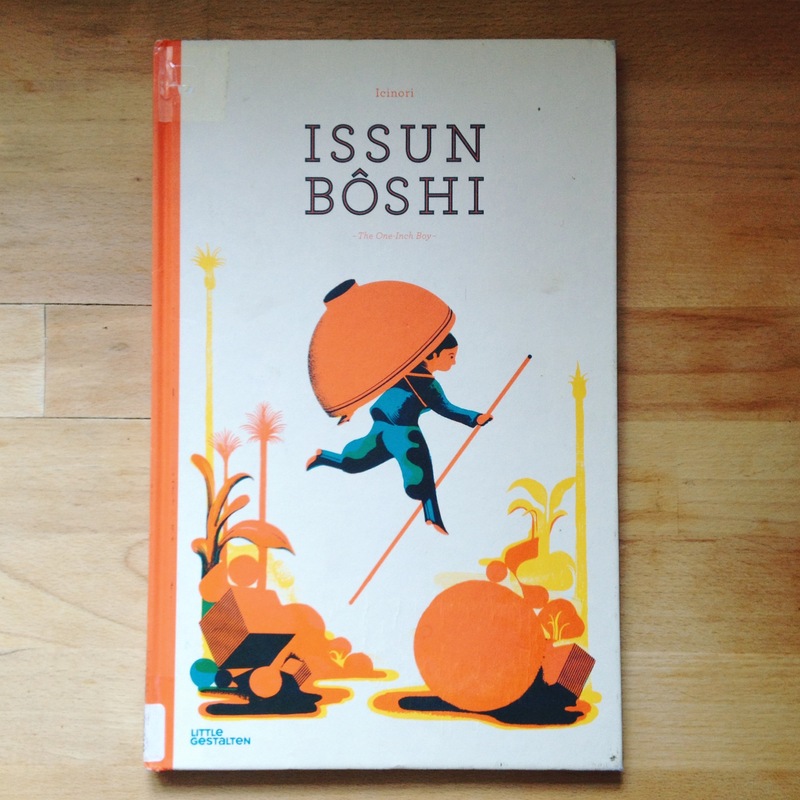 To cherish the memory, I will share Issun Bōshi: The One-Inch Boy by the French illustration duo Icinori (Little Gestalten 2014), a book that reminds me of the great September in Spain and has also become one of the biggest inspirations. Issun Bōshi (The One-Inch Boy, or sometime translated as “Little One-Inch” or “The Inch-High Samurai”) is a classic Japanese fairy tale about a boy born only 1 inch in height and never grew taller. This Icinori version is fairly true to the original fairy tale: A childless old couple was blessed with a tiny boy, Issun Bōshi. One day Issun Bōshi embarked on his journey to the capital to be a worrier, with a bowl as a boat, a chopstick as a paddle, and a needle as a sword. In the capital, he was hired by a rich noble man to entertain his daughter. One day, the daughter went for a walk in the forest, an oni (ogre) kidnapped her. As Issun Bōshi attempted to save the girl, the oni swallowed him up. Issun Bōshi used the needle to stab at the oni in the stomach and made it spit him out before scurried off. With the magic hammer, Uchide no Kozuchi, dropped by the ogre, Issun Bōshi turned into a tall and strong man and it changed the way the daughter saw him. Issun Bōshi is a very old story but Icinori reimagined and made it fit for the 21st century readers, both children and grown-ups. I really like the way they put a bit more emphasis on the relationship between Issun Bōshi and the nobleman’s daughter and left the ending open! I must say the main and best feature of this book is the stunning artwork by Icinori (Mayumi Otero and Raphael Urwiller). It’s Nice That calls them “a couple united by their unbridled love for print”. Huge influence of Japanese ukiyo-e, 80s graphic designs and 90s school textbook illustrations are evident across their work. Naturally the Japanese-ness works very well for this particular story. However, what keeps their illustrations from being ‘cliche’, which often happens when illustrating stories from ‘other’ cultures/countries, is their bold and striking colour palette and sophisticated quirks. For example, in Issun Bōshi, you see Japanese style houses and kimono, but they are mixed with right amount of non-Japanese details. My favourite spread is this sailing through mountain scene. Here you see exotic, tropical trees and plants instead of something typically Japanese like bamboo trees. As a result, they created their own fantastical, alternative ancient Japan, which is a work of genius. Not just in Issun Bōshi but in all their work, Icinori creates stunning illustrations that are retro and contemporary at the same time. Their limited colour illustrations are seemingly simple at the first glance, but if you look closely, you see lots of details and layers. This is the kind of craftsmanship I really get inspired. I’m currently working on my new picture book – reimagined The Nutcracker, which I’m planing to submit to the Bologna Children’s Book Fair. I’m doing it digitally to achieve ‘print’ look and Icinori, their Issun Bōshi in particular, has been one of the biggest inspiration. Now you can imagine how I felt when I saw this book in the bookshop. It was a mixture of jealousy and admiration. My idea was brilliant, but just someone had the same idea and they were hundreds steps ahead of me and they happened to be amazing illustrators… I’m glad to discover this book and Icinori though! Anyway, every time I see this book, it brings me back the fond memory of the Picturecamp. By the way, I heard the Picturecamp has just enjoyed its third edition. This year’s guest teachers included Jim Field, Kitty Crowther, Chris Haughton and Chris Riddell (!!!) as well as Picturecamp regulars – Benji and Alexis. I don’t know there will be another one next year, but it’s worth keeping your ears out if you’re interested! I love the way that some of the layers of the illustrations are transparent! Also, you can still create your own versions of the traditional stories. There is room for parallel versions. Think about Winnie the Pooh, Paddington Bear, and Corduroy — all stories of toy bears, but all different and all beloved!